Gallery of Cold Wax Paintings with details of the tools and techniques used. Giving insight into the techniques and the tools used. 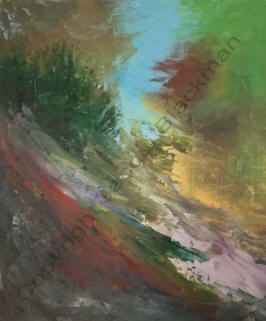 This painting using Zest-it Cold Wax Painting Medium and Oil paint is on a heavy linen canvas, 16" x 20", using Round and Flat bristle brushes. 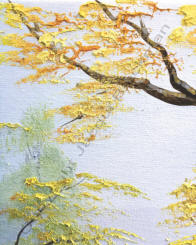 The Round brushes were used to paint the trees using a stippling action. The highlights were added to the tree tops using wax/oil paint thinned with the Zest-it Wax Solvent. Using the Cold Wax Painting Medium with the oil paint gave the painting more texture and it dried faster than a painting of this type using just oil paint. The colours were; Titanium White; Ultramarine Blue; Citron Yellow; Burnt Umber; Lamp Black. The mediums were; Cold Wax Painting Medium; Wax Solvent and Zest-it Damar Picture Varnish. 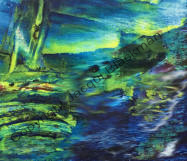 This painting is Cold Wax Painting Medium and Oil paint, on a cotton duck, medium weave canvas, 16" x 20". 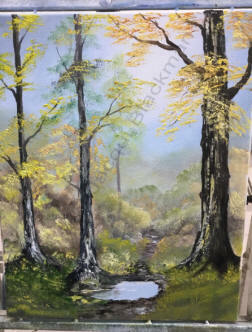 The background area was painted using both round and flat brushes, the path, the puddle area and the trees were applied with a painting knife, as was the foliage of the larger trees. 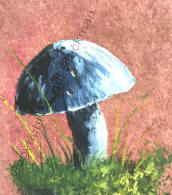 Zest-it Clear Painting Medium was used to give a softer texture to the foreground grass and the puddle surface. The colours were; Titanium White; Ultramarine Blue; Prussian Blue; Cad Yellow equiv; Burnt Sienna; Burnt Umber; Lamp Black. This is a primed Birch Ply board 10" x 12", painted with Cold Wax Painting Medium and Oil paint. All the wax/oil mixture was applied using Painting knives, some areas are smooth and some very textured. This was painted on a cotton canvas that proved to be full of 'sluby' threads, which were not apparent until the Cold Wax and Oil paint was applied thickly to the surface. These things only become apparent when you test products, that's why 'it always pays to know your equipment'. The colours; Payne's Grey and Yellow Ochre. Tools; Painting knives and Flat brushes. This Birch Ply board is 12" x 12" and was not primed, this allows for a different way of applying the Cold Wax and Oil paint mixture. 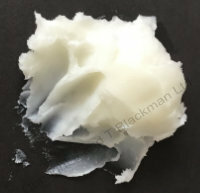 The wax/oil layers could be built up and were easy to smooth to the desired effect. Materials; Cold Wax Medium; Wax Solvent for cleaning tools. Tools; Painting knives; Palette; cloth/rag for texture; mesh for lifting off. These Cold Wax and Oils, are painted onto a gesso primed, fine Linen, stretched canvas. The branch is thinned wax and oil paint using a Rigger brush. The background was applied using brushes. The tree foliage was applied with a knife. The texture made using the wax/oil and knife allows the foliage to stand proud of the canvas and it dries without losing its shape. 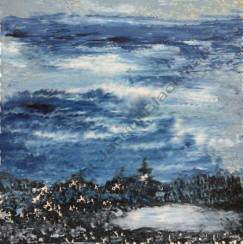 This 12" x 12" panel was first painted with the colours that were to reflect and the dark wax/oil layered over the top. 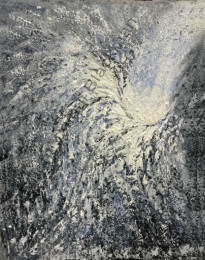 The water movement was incised into the surface using a Painting knife and letting the under colour show through. There is very little brush work in this piece. The colours you use are not important, it's about exploring what you can do with the medium, even if it takes you on a different path than that intended at the start. Painting with Cold Wax Painting Medium is a journey of uncharted areas, it has few rules - no fat over lean, no thick over thin, no fuse after every layer, no rigid surface only - you paint as you wish to express! This Cold Wax Painting Medium and Oil paint are on oil painting paper fixed to a set of stretcher bars. This gives a slight flex to the surface, similar to the behaviour of a canvas. The painting was done almost completely with brushes and the slight flex gives a good reaction for the brush work. It wasn't primed just painted onto as is, the slight absorbency and tooth of the surface gives the wax/oil a suitable surface to live a good life. My Grandfather, in his early years, painted scenery on paper for theatre productions and painted many of his oils on paper. I have some that are over 85 years old and in better condition than his younger works on canvas! Turner, Bonnard and Constable made good use of paper for their oil painting! 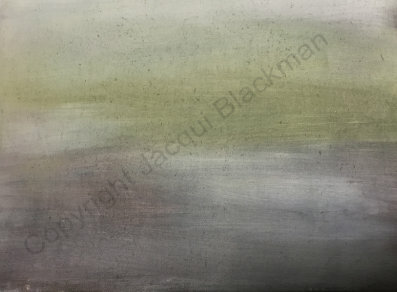 This painting is on paper with the dark under colour applied using just oil paint, then Cold Wax Medium and Titanium Oil paint were mixed and applied with a knife. Not only is there a contrast in colour, there is a contrast in the paint texture and style. Doing paintings outside of your normal style has lessons to teach, about the way you paint, perceive, translate and adapt. Painting with Cold Wax Painting Medium is very freeing, once you manage to let go of previous preconceived notions and ideas, which can make it a challengingly enjoyable experience. Painted onto a Primed Birch ply board, thick knifed impasto sections and light glazes brushed on using thinned Cold Wax Medium. Thinning the Cold Wax gives a very useful mixture that can be used for glazing. The viscosity needs to be that of thin custard and it can be easily coloured with oil paint before use. Knife and brush work for this 'wet-on-wet' painting. Types of wet on wet technique have been used since the 1300's. This useful way of applying paint was much used in the late 1800's, early 1900's, artists like Titian, Monet and Van Gough were just a few of its exponents. Also used by traditional - sign-writers, pottery painters, theatre scenery artists and many others, it can be put to good use with Cold Wax. This is a heavy weight, handmade paper, it has a rough hard sized surface, but with enough absorbency to suite the Cold Wax Painting Medium and Oil paint mixture. Often painting is about selecting the correct tools for the effect you want to achieve. 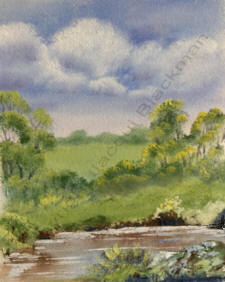 The clouds and background were applied with brushes. 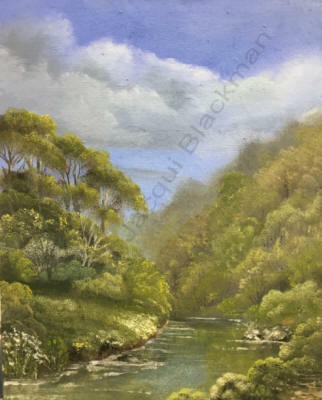 I could have painted the clouds and the background with a knife, which on this rough paper, would have been like cracking a nut with a sledge hammer, you definitely get a result, but was it the best result! As always with painting choosing your surface and the correct tools for the media you use, makes such a difference to the end result. 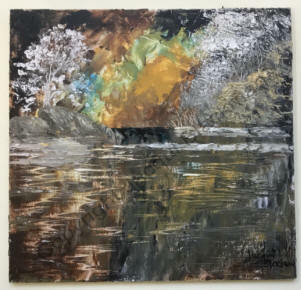 Hopefully these paintings and explanations will give you cause for thought as you enjoy taking your painting in a new direction using the Cold Wax Painting Medium.